This server has received 2229352 hits from both ipv4 and ipv6. 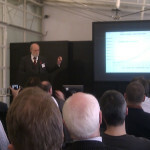 Vint Cerf, founding father of the internet, spoke yesterday at the first 6::UK conference to promote adoption of the next generation IPv6 IP addressing system. 2020Media was at the event and was pleased to find our preperations and progress are already well ahead of most of UK business. 2020Media published its plans for IPv6 last year here. It’s anticpated that all IPv4 addresses will be allocated from the central pool by summer 2011, so the 6::UK group aim to encourage all UK stakeholders to act now to be ready for the new addressing system. Any broadband customer who’d like to start using IPv6 on their connection can do so right now, for free, using our free tunnelling service. Please contact us to request a tunnel.